We are proud to announce the addition of Northstar Systembuilt Homes located in Redwood Falls MN to our family of builders. Northstar Systembuilt homes are high quality IRC modular homes. In fact they only build modular homes! Their durable construction features double 2X10' rim joists on the perimeter and triple 2X10' joists at the marriage line. Perimeter outside walls consist of 1/2" OSB on the exterior and interior walls adding superior strength. The windows are double hung, double pane, doube strength glass, low-e with argon gas from Vector Windows a leader in the industry. The Certanteed Timbeline architectural shingles offer a limited lifetime warranty. Northstar offers LP Samrtside siding with a 50 year warranty. Standard insulation is R-21 in the sidewalls and R-50 in the roofs. On the interior we offer Mid-Continent cabinetry in several styles and colors, Doors are by Bayerbuilt. Standard carpeting is from Shaw with a 40 ounce weight and an 8 pound rebond pad. Baths and toilets are from Mansfield and the plubing fixtures are Moen. Appliances are from GE. Only the best of the best find their way into a Northstar Systembuilt home! 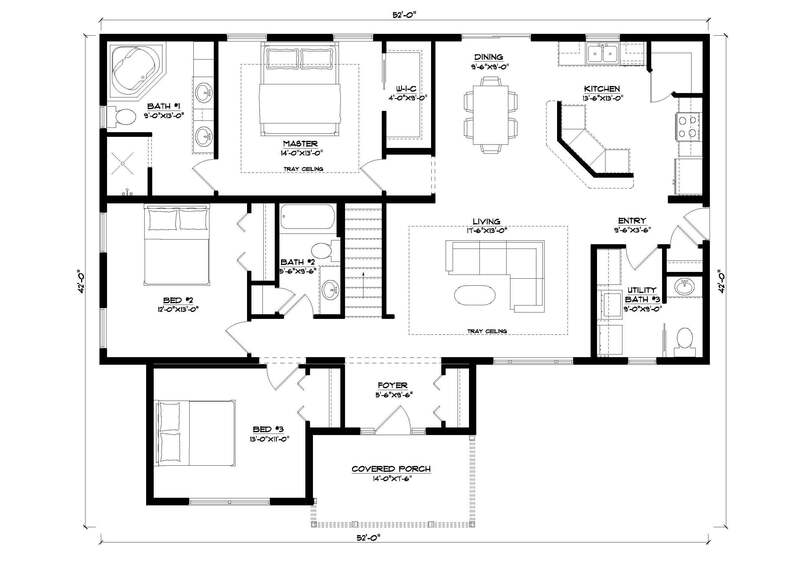 The "Roanoke" is a 3 bedroom 2 1/2 bath, 42X56' three piece basement modular home. It features a covered porch which leads to a formal entryway and from there to a large open floorplan spanning the living room, kitchen and dining area. The stairwell to the basement is off of the living room with beautiful wrought iron ballisters. Behind the kitchen is an amazing wrap-around walk-in pantry. The master suite includes an ample walk-in closet and master bath with double vanities, plenty of storage, a large soaker tub and seperate ceramic tiled shower. The home has 9' sidewalls and coffered ceilings enhancing the elegant finishes throughout.